Smaller cities might have struggled to accommodate the 23 sports of the 1984 Summer Olympics, but not Los Angeles. Organizers took advantage of the Southland’s existing world-class venues, enlisting everything from the Anaheim Convention Center (wrestling) to Inglewood’s Forum (basketball). Here are a few of the most memorable. 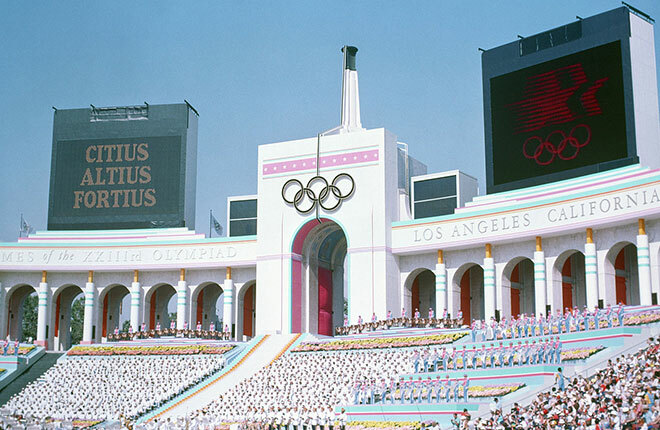 A veteran of L.A.’s first Olympic games in 1932, the aging Coliseum needed extensive renovations for the 1984 games. Once spruced up, it hosted track and field events as well as the opening and closing ceremonies. UCLA and USC Athlete Villages. Some 11,000 athletes made L.A. their temporary home for the 1984 Olympics, and the city’s two biggest universities—their dorms and dining halls emptied for summer—shared the honor of hosting them. UCLA’s village entertained athletes with a pop-up disco club. USC’s site also showcased American culture for the visiting athletes, temporarily transforming a classroom building into an indoor shopping mall. How could L.A. host the Olympics and not incorporate its most iconic architecture—freeways? For one Saturday morning, bicycles rather than cars raced down the 91 freeway between Carson and Buena Park as 27 time trial teams pedaled down an empty freeway. Naturally, the race started on an on-ramp. Marathoners took over another freeway: the 90 between Marina del Rey and Culver City. Their 26.2-mile course took them through Brentwood, down Santa Monica’s Ocean Avenue, and past Leimert Park before a dramatic finish inside the Coliseum. “How would you like to have the Olympic velodrome?” head organizer Peter Ueberroth asked the president of CSU Dominguez Hills. “We’ll take it,” he answered and then quickly followed up with: “What is it?” An oval-shaped cycling track, the concrete structure on the Carson campus was the first world-class velodrome on the West Coast. Racers flew around its steeply banked curves at 47 mph. But it didn’t last long: the StubHub Center, home to the Galaxy and Chivas USA, replaced it in 2004. Pasadena’s iconic stadium is best known for American football, which isn’t an Olympic sport. So in 1984 it hosted soccer, which is. 101,799 spectators flocked to the Rose Bowl to see France defeat Brazil, 2-0, and claim the gold.